Like clockwork, the changing of the seasons brings about a bevy of blockbuster films to distract the masses from the standard “award bait” onslaught. With it comes another Thor film, exactly what few people were clamoring for. Not entirely a mark against the character, but so far his standalone movies have struggled more than others in the Marvel Cinematic Universe. Maybe third films are when Marvel slightly lets down its guard, allowing for more fluidity, as no one could have foreseen Thor: Ragnarok being one of, if not the most entertaining superhero films of the last few years. The self-assuredness presents itself right away. Thor (Chris Hemsworth, here allowed to let his naturally charming freak flag fly), imprisoned in a small cage, bemoans his failure securing any of the infinity stones in the past two years. A knowing jab at the ever illusive connecting tissue leading up to Avenger: Infinity War. It’s the first of many subversive moments Ragnarok relishes in. As he plummets from the cage he continues with his exposition dump, tongue ever so firmly wedged in cheek. The monster he confers with, Sutur (Clancy Brown), is set to bring about Ragnarok, the much prophesied destruction of Asgard. Thor, ever the dashing hero, laughs it off, while engaging in one of the biggest battles in any of the Marvel outings. Except here it’s backed by Led Zepplin’s “Immigrant Song”. Director Taika Waititi (Hunt for the Wilderpeople) paints it like the kind of heavy metal fantasy images teenagers used to adorn their binders with. Sadly not everything is sunshine, lollipops and rainbows. 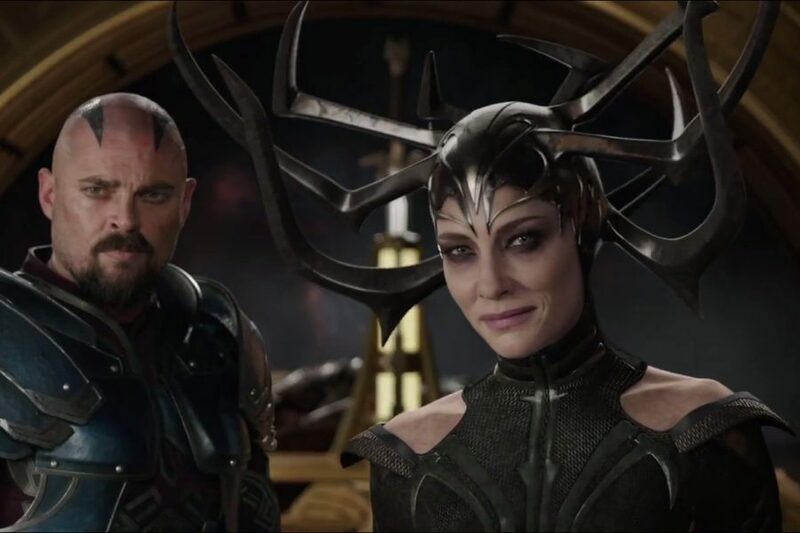 In Asgard, a conflicted mercenary, Skurge (Karl Urban) mans the bifrost bridge, instead of Heimdall (Idris Elba). Statues have been erected of Loki (an ever jovial Tom Hiddleston), along with plays dedicated to his memory. After sniffing through the ruse, Thor makes a pit stop in Midgard, “Earth”, to find the exiled Odin (Anthony Hopkins). Odin warns Thor about the return of his daughter, whom his life force has previously kept at bay. Hela, embodied by a sneering and smoldering Cate Blanchett, who claws her way through the scenery, is no push over. Through a series of escalating unfortunate events, Thor finds himself without his trusty hammer Mjolnir, shorn of his trademark flowing locks, stranded on the planet Sakaar. 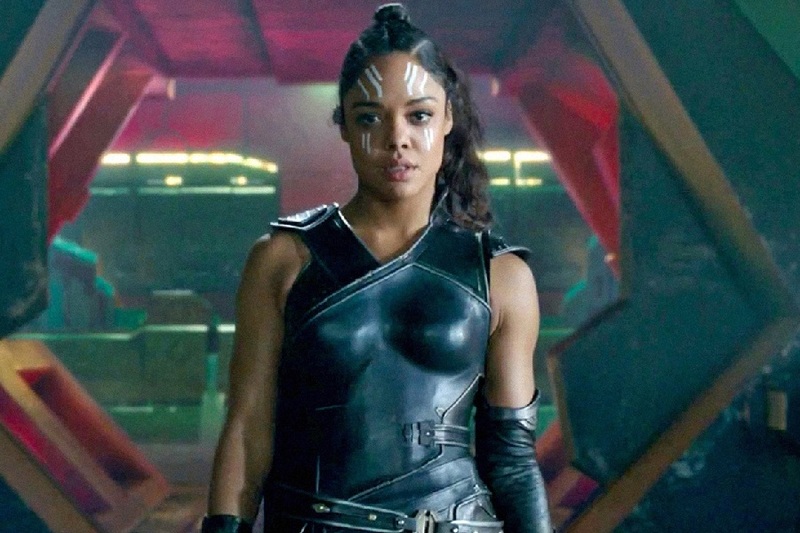 What’s more, he gets captured by Valkyrie (a gloriously game Tessa Thompson) and forced to fight in a tournament, run by the de facto ruler, The Grandmaster (Jeff Goldbum, at his Goldblum-iest). All of this, yet no mention of The Hulk/Bruce Banner (Mark Ruffalo)? Arguable the biggest draw or oddity from the trailers? His part doesn’t disappoint. With such a large stable of heroes it may seem odd the big green menace constantly appears in “guest starring” roles, yet the mega studio may be onto something here. Without saying much, Ruffalo sells the part of a bamboozled Banner with the grace of a consummate pro. There are some rather heady things lurking throughout Ragnarok, but they’re usually undercut by scene full of colors and comedy, to lessen the blow. Waves of people are massacred, series regulars are dispatched of quickly, only for the tone to shift suddenly. It would seem rather haphazard if it wasn’t cemented earlier as a welcome change of pace. Has it been mentioned how funny Ragnarok is? Because this may be the funniest movie of the year. Uproariously so. Jokes fly at a frenetic pace that practically begs for people to see the film a second time, just to catch moments they laughed over. 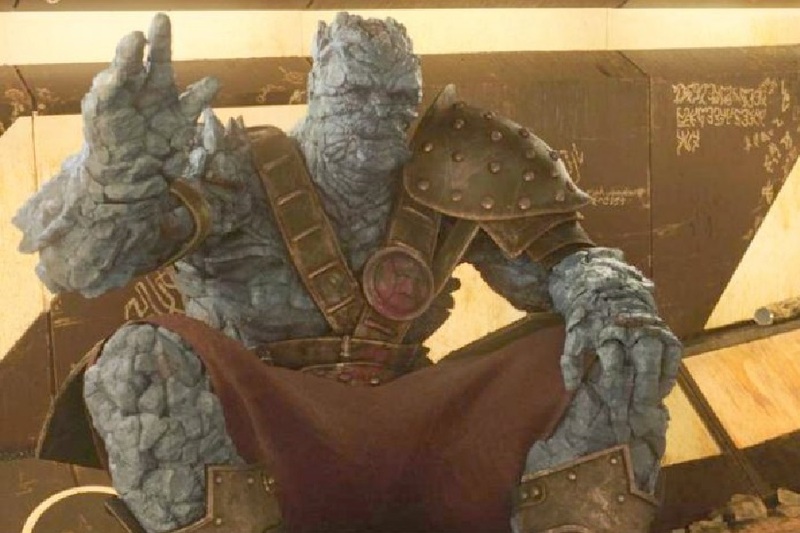 So much so that the traditional comic relief, Korg (voiced by Waititi), seems to exist on another plane. As much as Waititi toys with the preceding Marvel features, Ragnarok is constrained by the same shackles. At this point it’s almost a joke of its own. That the element which holds back these films tends not to be the makers, but the structure mandated by the studio itself. Unfortunately the individual who feels the brunt of this the most is, as usual, the villain. Hela is possibly the most menacing of main villains yet to grace the screen, though still relegated to secondary status. You know there’s a deep seated problem when “big bads” are essentially window dressing. Few modern blockbusters are allowed the opportunity to be as big, quirky or fun as Thor: Ragnarok. Even more so than the recent Guardian’s of the Galaxy pictures. Though it may give way to the inevitable “it’s great, buuuut” that dominate discussions concerning most Marvel films, this one’s slights are lesser than before. That’s pretty huge when it comes to a Thor feature, previously the red-headed stepchild of the MCU. You’ll laugh to the point of tears, be wowed by grand spectacle and leave the theater thinking this Thor is the mightiest of all.